George Henry Allen (the misspelling “Allin” occurs often in the family history) was born at No 2 Jubilee Terrace (now 3 Jubilee Road) in Newbury 1896, the son of John Henry Allen, a Newbury police constable, and his wife Rosa Ellen née Malt. George Henry’s grandfather George, originally from Bray in Buckinghamshire, had been a seaman and had retired in the 1880s to become the caretaker of the Upper Thames Sailing Club in Marlow. John Henry, born in Maidenhead, and Rosa, who was from Hungerford, married in Rosa’s home town in 1894. In the period following their marriage the pair lived in the Newbury area, both George Henry, their eldest child, and his sister Lilian Caroline were born there. However, by the time a second sister Ethel was born in 1900, the family had moved into London. In 1901 they were living in Lambeth. George Henry’s father was now a piano polisher and may have been employed at the nearby Munts piano factory. His mother died in the early part of 1909 and at the time of the 1911 census, George Henry was living with his widowed father and two of his sisters in Hackney. He had joined his father in the piano manufacturing trade, having become a piano player (what we would call a pianola) maker. The only known picture of George (marked with an X) resting with his comrades during a route march. 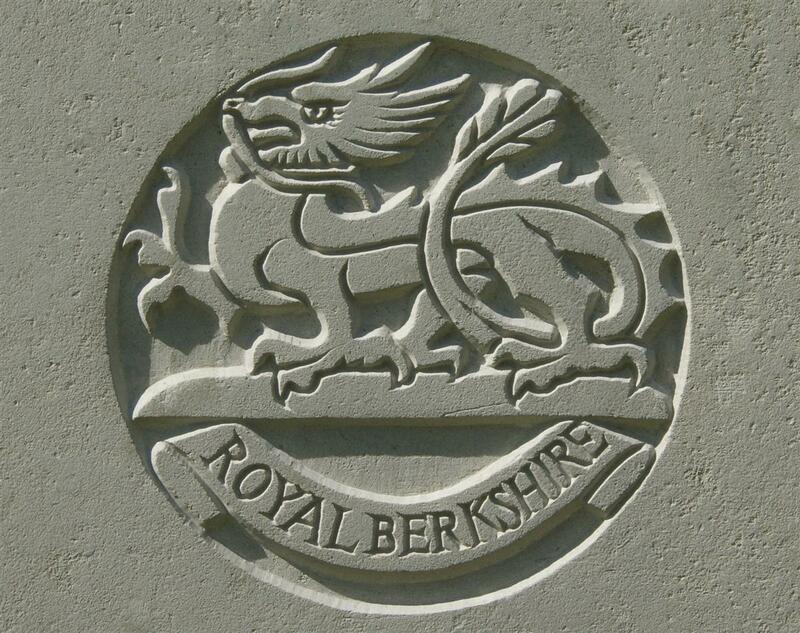 When George Henry reached his late teens, it would appear that the piano trade had lost its attraction and he made his way to Reading where, on 19 July 1913, he enlisted into the Royal Berkshire Regiment, joining the 1st Battalion, then stationed in Aldershot. At 5.30pm on 4th August 1914, the day war was declared, the battalion received its mobilisation orders. 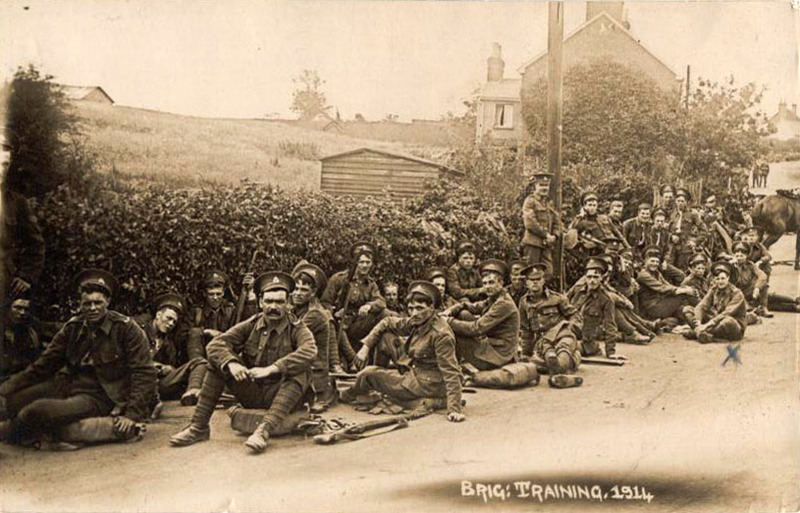 The battalion departed Southampton for France on 12th August, landing at Rouen on 13th August, forming part of the 6th Brigade of the 2nd Division. The battalion moved first by train and then on foot northwards towards the German army, and by 23rd August were dug in not far from Mons. On 23/24th August the battalion had its first experience of artillery fire and there were some minor engagements but on 24th August, orders to retire were received; what became known as the Retreat from Mons had begun. In the evening of 25th August, the battalion crossed the bridge over the Sambre and arrived in the village of Maroilles. The 15th Hussars had been deployed to hold the bridge against the advancing Germans but came under great pressure and first one Berkshire company, and then the three others were sent forward to retake and hold the bridge. All efforts failed and before day break on 26th August the Berkshires were withdrawn and the retirement continued. Marouilles (Maroilles), France Troops delayed entering billets owing to a false alarm that the Germans were entering the Town - "C" Company was despatched to take over Bridge over R SARNE (Sambre) from cavalry at end of Town. At 8pm battalion was ordered to march out and assist this company to take the bridge from which the cavalry had been driven. Bridge taken about 1.30am after a night attack by C, D and B Coys. 1/KRR relieved the Battalion and 6th Brigade marched out at 3am. Arrived at VENEROLLES at 7.30pm and bivouaced on hill south of village along WASSIGNY road. Casualties. Major AS Turner, Capt H Shott missing. Lt. VS Hopkins slightly wounded. 61 other ranks killed, wounded or missing. By holding the bridge the German advance was delayed allowing the streets of Maroilles, congested with refugees, to clear, allowing retreating British, Belgian and French troops and wagons and horses, to get away to fight again. Similar actions were happening throughout the retreat from Mons. By delaying the German advance, even by a few hours, the momentum was taken out of their progress and gradually the very real threat of the capture of Paris and the BEF being driven back to the sea was averted. Five of the stones (each holding two names) on the mass grave at Maroilles. 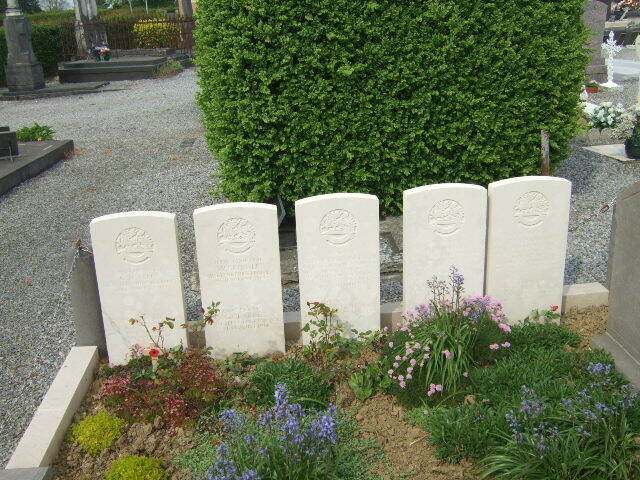 George and seventeen of his comrades from the 1st Berks were buried, quite possibly by the Germans, in a mass grave at the communal cemetery in Maroilles. George is not commemorated on any war memorial in the UK, this is not uncommon among those who moved around a lot not staying long enough in any one place to become a part of the community. Some even avoided having their loved ones on memorials that they thought glorified the war they hated. Until recently George’s only commemoration apart from the stone over his grave has been his entry in the Commonwealth War Graves Commission’s Debt of Honour register. Now his name has been added to the Newbury Virtual War Memorial where this Newbury born soldier is honoured alongside many comrades with Newbury connections who, for one reason or another, are not commemorated on any local town or village memorial. Thanks to George's great niece Caroline Moult (née Walters) and Max Double for this story and the pictures.